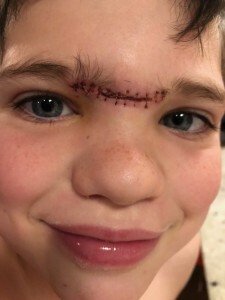 Two weeks ago, living up to his expectations as an active and adventurous little 8 year-old boy, my son tried some acrobatics on our second-floor banister, lost his balance and landed right on his head on our wooden first floor below. Let me say right off the bat, he’s okay!!! But, holy smokes! That was scary, right?? We’ve all had these horrific moments that after an ER visit and a bunch of stitches or whatever the case may be, we ended up just fine. Our brains are wired up to remember these incidences with a surprisingly keen detail. And, how long ago was that? Although our brains carefully catalog horrible memories along with all of the gory detail, it largely forgets all the good times. This doesn’t seem fair, but because your brain is obsessed with survival, it makes perfect sense. As little ones, we tend to be really good at shaking off or forgetting our traumas so we will move forward in our development and become full grown humans and fend for ourselves. But, as time goes on, we get a bit better at remembering, filing and reliving our traumas so we can avoid these dangers in the future and live longer lives. Think about it, babies will keep getting up to walk no matter how many times they fall on their butts. The brain allows this amnesia knowing that walking is way worth the bumps and bruises because having this skill greatly increases our chances of making it in this world. Less than 12 hours after the fall incident, I went to pick up my daughter at a friend’s house and while my head was turned, my boy just crawled onto their trampoline and started jumping!! He apparently had already forgotten that he had just busted open his head! Since then, I have found myself repeatedly having to remind him. What the…? Conversely, I simply couldn’t get the accident out of my head. Up to four or five days later, I was still waking up in the middle of the night having seen what I saw (and it was some messed-up, bloody, Jamie Lee Curtis action) and hearing what I heard (the loudest THUNK! ever). Because my brain doesn’t really know the difference between thinking about my boy falling and my boy actually falling in that moment, I would have the same physiological responses that panic tends to bring…over and over again. It was awful. Kids often store bad memories in a more helpful way. Which give us an opportunity to learn a lot. My son absolutely hates being the center of attention in any way, good or bad. He was pretty anxious about returning to school with an obvious head wound that would initiate concern and worse, warrant explanations. I picked him up after his first day back and asked him how it went. Then I asked him if he told anyone what happened. “The REAL story?” he asked. Over the next few days, I started getting texts from my friends that also have children at the same school. They were riddled with laughing emojis and goofy memes describing the elaborate stories that my boy had told their child. All the things that are actually true now that he is fine. As we grow older, not only is it important that we actively hardwire in all the good times in our memory banks (and I assure you, it is not by taking pictures like crazy or even telling everyone all it about in on social media, so maybe I’ll give a little tutorial in the next blog), it is also important that we learn what we would like to remember, and remember exactly what we would like to forget. But it’s not all hopeless. We know now that we can recall a memory and then update it (kind of like an app) so it’s not filed under “the super scary thing that happened to me” but just “one thing that happened to me.” It doesn’t carry the weight that it did before. You still remember the incident, but it’s just not so bad. I’ve had the opportunity to do this therapeutic approach with some of my clients and the process is quite amazing…and it looks a lot like what my boy is doing with his stories to cope. When one has overcome a traumatic incident, they may be detached, as a matter of fact in their attitude regarding it, speak of it in humorous tones, or barely remember their story at all. They feel separate from it, as if it isn’t really a part of them anymore. Now, you are fine. Now you are safe. It’s important that the whole brain knows this to be true.